(Phys.org)—Researchers have built a new type of "neuron transistor"—a transistor that behaves like a neuron in a living brain. These devices could form the building blocks of neuromorphic hardware that may offer unprecedented computational capabilities, such as learning and adaptation. The researchers, S. G. Hu and coauthors at the University of Electronic Science and Technology of China and Nanyang Technological University in Singapore, have published a paper on the neuron transistor in a recent issue of Nanotechnology. In order for a transistor to behave like a biological neuron, it must be capable of implementing neuron-like functions—in particular, weighted summation and threshold functions. These refer to a biological neuron's ability to receive weighted input signals from many other neurons, and then to sum the input values and compare them to a threshold value to determine whether or not to fire. The human brain has tens of billions of neurons, and they are constantly performing weighted summation and threshold functions many times per second that together control all of our thoughts and actions. In the new study, the researchers constructed a neuron transistor that acts like a single neuron, capable of weighted summation and threshold functions. 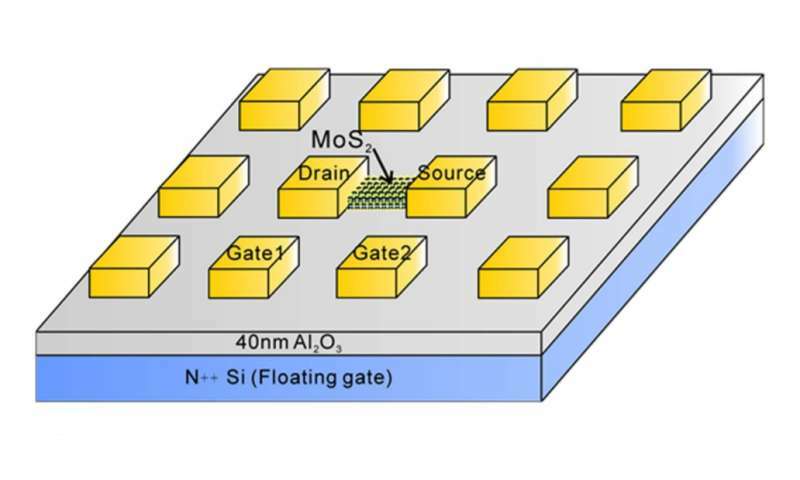 Instead of being made of silicon like conventional transistors, the neuron transistor is made of a two-dimensional flake of molybdenum disulfide (MoS2), which belongs to a new class of semiconductor called transition metal dichalcogenides. To demonstrate the neuron transistor's neuron-like behavior, the researchers showed that it can be controlled by either one gate or two gates simultaneously. In the latter case, the neuron transistor implements a summation function. To demonstrate, the researchers showed that the neuron transistor can perform a counting task analogous to moving the beads in a two-bead abacus, along with other logic functions. One of the advantages of the neuron transistor is its operating speed. Although other neuron transistors have already been built, they typically operate at frequencies of less than or equal to 0.05 Hz, which is much lower than the average firing rate of biological neurons of about 5 Hz. The new neuron transistor works in a wide frequency range of 0.01 to 15 Hz, which the researchers expect will offer advantages for developing neuromorphic hardware. In the future, the researchers hope to add more control gates to the neuron transistor, creating a more realistic model of a biological neuron with its many inputs. In addition, the researchers hope to integrate neuron transistors with memristors (which are considered to be the most suitable device for implementing synapses) to construct neuromorphic systems that can work in a similar way to the brain. awesome, sign me up for a daughter board on my brain! the ai system remotely.Then alert the owners when someone has hacked into it. In the world of neuron-utilizing ugly sacks of mostly water, hacking is done with marketing. This statement is, of course, sententious nonsense, but unfortunately par for the course in the domain of "the brain is a computer" idiocy.